Overseas Filipino workers (OFW) must put sending additional remittances back home as a consideration as a temporary back-up for their families as they are dealing with soaring prices of commodities due to inflation believed to be an effect of the newly implemented tax reform via Tax Reform for Acceleration and Inclusion (TRAIN) law. Geslani also added that the increase in prices of oil on the world market causes a domino effect on the prices of consumer items, and adding financial pressure to OFW families. The enrolment season and tuition fees for their kids who go to school have to be paid. 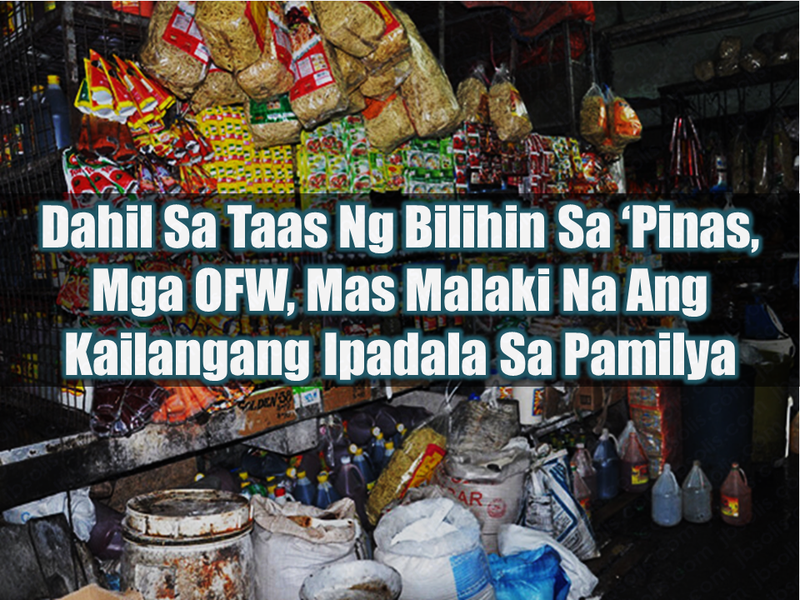 Geslani urged all OFWs who can send a little extra to do so for their families to catch up with the rising expenses due to the price hike. The government said headline inflation rate climbed at 4.6 % in May as compared to 2.9% of the same period last year mainly caused by price increases in fish and seafood, fuel and lubricants and bread and cereals. Average inflation during the five-month stretch was at 4.1 %, higher than the government’s 2 - 4 % target for 2018. Legislators and vested groups were calling for the suspension of the Tax Reform for Acceleration and Inclusion law, which reduced personal income tax rates but raised the excise tax on petroleum products and automobiles after crude oil price hit $80 a barrel in global trading and consumer prices spiked. Their clamor was hinged on the notion that ultimately households were bearing the burden of TRAIN’s immediate effects on the economy. Previous surveys have estimated that one of every 10 Filipino households have at last one family member working overseas, whose cash remittances reached $28.1 billion in 2017. 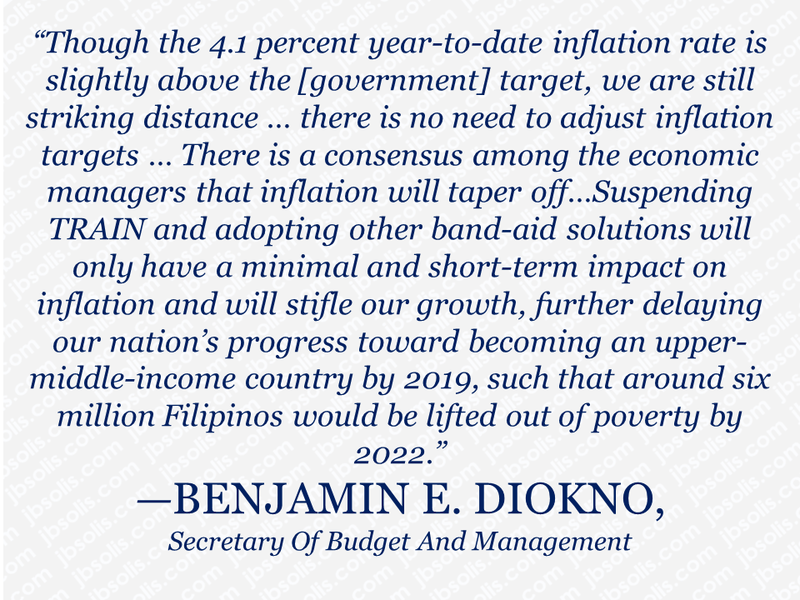 The government economic team, however, was confident that inflation would taper off towards the end of 2018, even as it rejected the calls for the TRAIN law’s suspension. Still, the financial experts see inflation rates to remain elevated for the most part of the year before reverting back to pre-TRAIN levels by 2019. 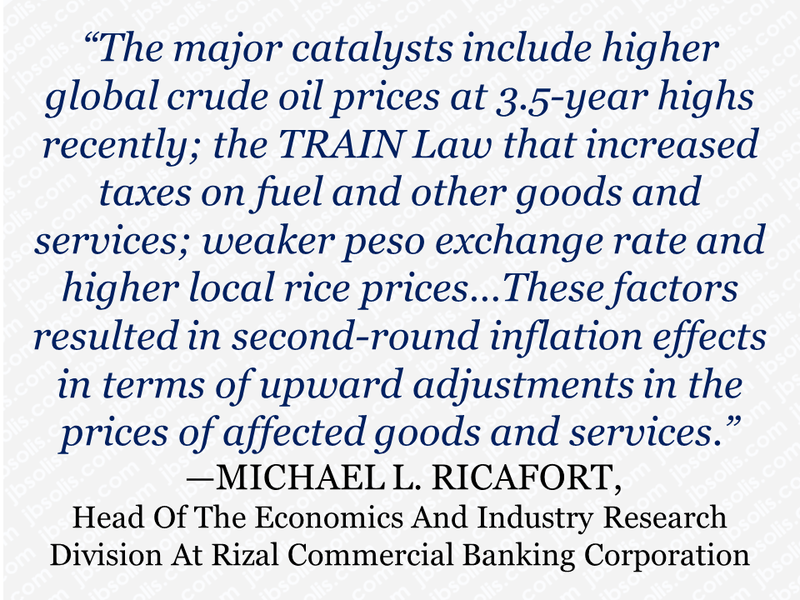 “Inflation could start to normalize lower in 2019, around January and February, exactly a year after the effectivity of the TRAIN Law,” Ricafort added.